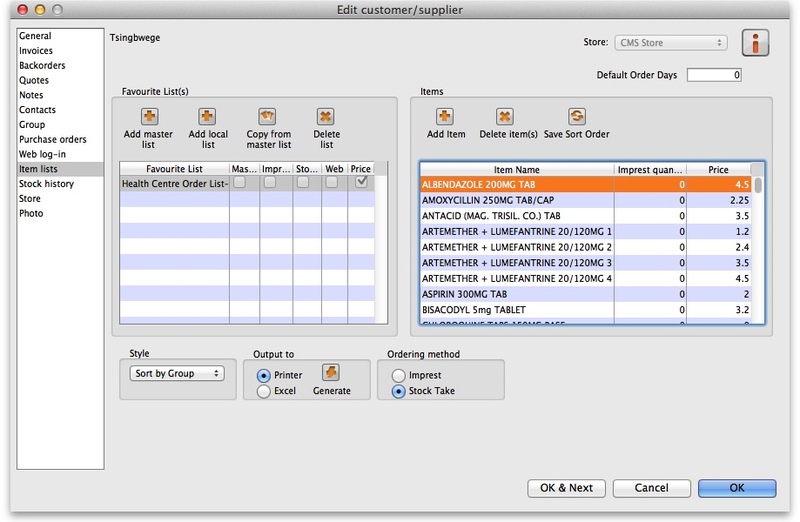 If this preference is ticked then the item margin will be used instead of the supplier margin. If it is unchecked then the supplier margin will be used instead of the item margin. You can fix the item price under the General tab in the Item details window. Note that setting an item price here will set the price of new stock as you receive. It will not affect the price of existing stock- you can change existing prices if you have permission to do so by viewing an item and going to the “Stock” tab. To customise the pricing, add a list to the Favourite Lists column (either by clicking Add master list, Add local list or Copy from master list) or edit an existing list by double-clicking on it. Check the Price list checkbox from the window that comes up and any other checkboxes that you require. Make sure the list is selected and then go to the Items section of the window. Enter the corresponding prices that you would like to assign to each item for that customer by clicking on the item and then clicking on the price (“0” by default). You can also add items to the list by clicking Add item and entering the item name and the price in the window that appears. The customer will now be charged the prices set in the list instead of any other price set.